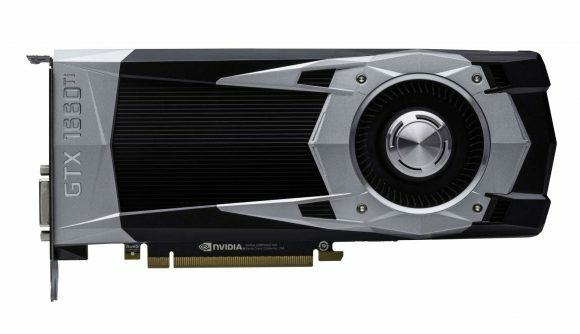 This graphics card is expected to launch sans ray tracing capable hardware, and, one would assume, also cut some of the Turing price premium we’ve come to expect from Nvidia’s 20-series graphics cards. That might mean the now heavily-rumoured GTX 1660 Ti will be the true mid-range successor to the GTX 1060 in the mainstream market. It was only a few days ago that an Ashes of the Singularity benchmark was spotted bearing the name GTX 1660 Ti, too. While that benchmark is notoriously flippant of standardisation, performance often varies more than one might expect, if these results have any semblance of accuracy about them we can expect some 20% better performance than the GTX 1060. The latest image was posted over at Reddit by user TheBloodNinja (via Komachi_Ensaka). Phone images can often be of questionable veracity, so make sure you protect yourself with rock salt. This one looks particularly doctored, in fact. Just look at the oversized ‘G’ not lining up with the ‘TX’ and the colour difference between the 1 and the two 6s. The image shows an Nvidia pre-briefing event, with the phrase: “One more thing, New GTX Turing” on the screen behind. Also on display is what looks to be a GTX Founders Edition shroud with the GTX 166- branding, the rest of the branding cut off. If this all rings true, and we’re still not convinced it does – we could expect a FE card with the similarly capable cooler from the 20-series Turing cards. Ever since the RTX 2060 launched at the grand ol’ price of $349, it’s been a sure bet that Nvidia would have something else up its sleeve to compete with AMD in the mainstream market. After all, the AMD Navi architecture is set to be AMD’s ace in the hole once it launches this year, finally replacing the aging Polaris architecture. And it’s looking ever more likely that Nvidia’s answer will be the GTX 1660 Ti, even if this leak itself isn’t totally veracious. There maybe some other 16-series (you sure about that name, Nvidia?) cards below it in the stack, too. After all, we can only assume there will be a non-Ti variant sometime in the near-future once all this plays out. Though there are conflicting reports that the GTX 1660 Ti is a mobile only variant, designed for mid-range gaming laptops, which would seemingly be backed up by the Ashes of the Singularity benchmarks being run on what looks like a laptop system.